All opinions are strictly my own, and I received no monetary compensation for writing this review. We create delicious, clean, nutritionally powerful products which help people to achieve optimal energy. The foods we make are RAW, VEGAN, GLUTEN-FREE, NUTRIENT-RICH, and always DELICIOUS. I'm specifically excited about their kale chips, which come in the following flavors: Zesty Nacho, Kool Ranch, Bombay Curry, Mango Habanero, and Texas BBQ. Of those flavors, I received the Zesty Nacho, and Mango Habanero to try. Ingredients: organic kale, organic mango, organic carrot, organic cashew, organic onion, organic apple cider vinegar, organic ginger, organic lime juice concentrate, organic spices, sea salt, organic mango concentrate. Overall, I was really impressed with these kale chips. I have also tried the Kaia brand kale chips, and I find these to be much, much better! All of the chips tasted tasted exactly like the titles. The Mango Habanero was sweet with a little bit of a kick and the Zesty Nacho tasted similar to cheesy nachos! All the chips were crunchy, too. Very good. I highly recommend trying these kale chips! Rhythm also sent me both of their new Sweet Potato chips to try. Of course, these chips were raw as well! They sent me one of each of their flavors: Sea Salt and Hickory BBQ. Ingredients: organic sweet potato, organic apple cider vinegar, organic spices, organic raw cane sugar, sea salt, natural liquid smoke concentrate. Ingredients: organic sweet potato, organic raw cane sugar, organic spices, sea salt. These were delicious as well! 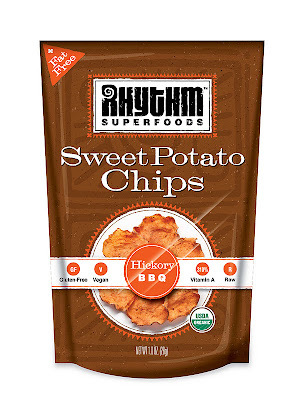 They were crispy and had a strong, authentic sweet potato flavor. I love that they are raw and are able to get that crispiness without deep frying in all that fatty oil! Again, both tasted exactly like their titles. Overall, Rhythm Superfoods has impressed me with their snacks. I really want to try the Kool Ranch flavor, mostly because I love ranch, and I think ranch kale chips would be delicious! I love Rhythm Superfood Kale Chips all the flavor's are soo good. I haven't found kale chips in a package to be as light as crispy as fresh ones - how did you think these compared to the homemade variety? @Heather - you know, I've never actually made my own homemade kale chips before! I really should try that! I tried to dehydrate some once, but the dehydrator I used didn't work, so they didn't turn out well. These were very crispy, though, and I enjoyed them. As for being light? They do have a lot of "stuff" on them, like flavoring.